Instant Pot Stuffed Pumpkin is so delicious! This is a Fall recipe that can be a main dish or a side dish. 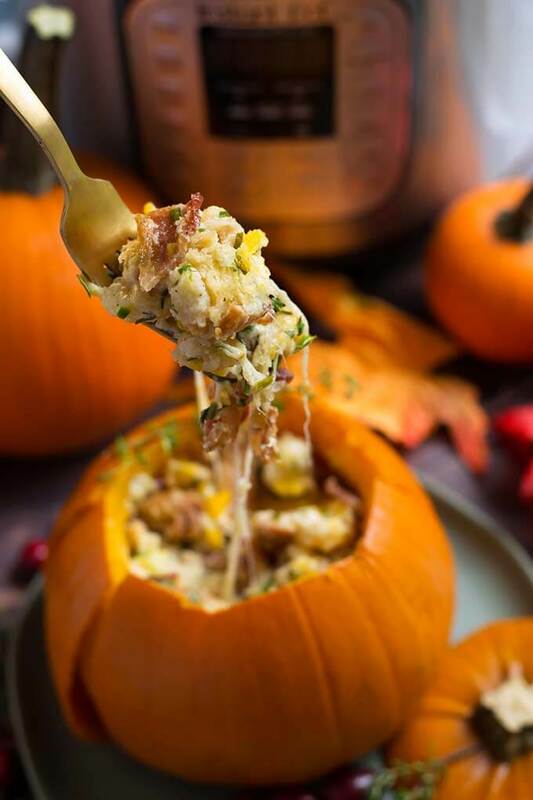 A pumpkin stuffed with a savory and creamy stuffing that you can change up to make it your own! 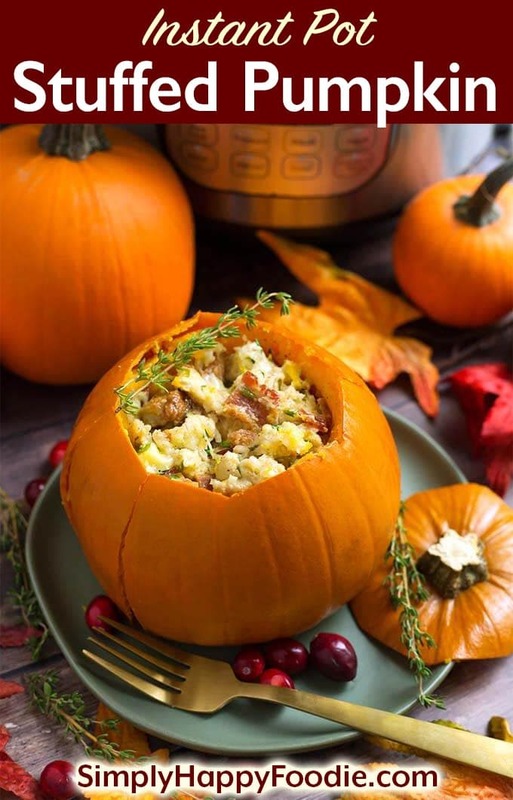 This pressure cooker stuffed pumpkin is as beautiful as it is scrumptious! Thank goodness it is Fall, so I can buy those cute little Sugar Pie Pumpkins! They are so versatile, delicious, and I use them in any recipe that calls for pumpkin. Or in this case, calls for the whole pumpkin! This recipe works best with Sugar Pie pumpkins. Carving pumpkins are not very good to eat, and it would probably be hard to find one small enough to fit in your pressure cooker! If you can’t find Sugar Pie Pumpkins, also look for them labeled as Pie Pumpkins, Baking Pumpkins, Fairy Tale, Autumn Gold, Cinderella, New England Pie Pumpkins, Baby Pam, Ghost Rider, to name a few. You’ll want to find one that is between 2 and 3 pounds. The one in my photos was 2 1/2 pounds. 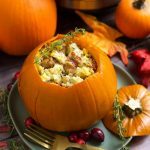 This delicious Instant Pot Stuffed Pumpkin recipe is very easy to put together. 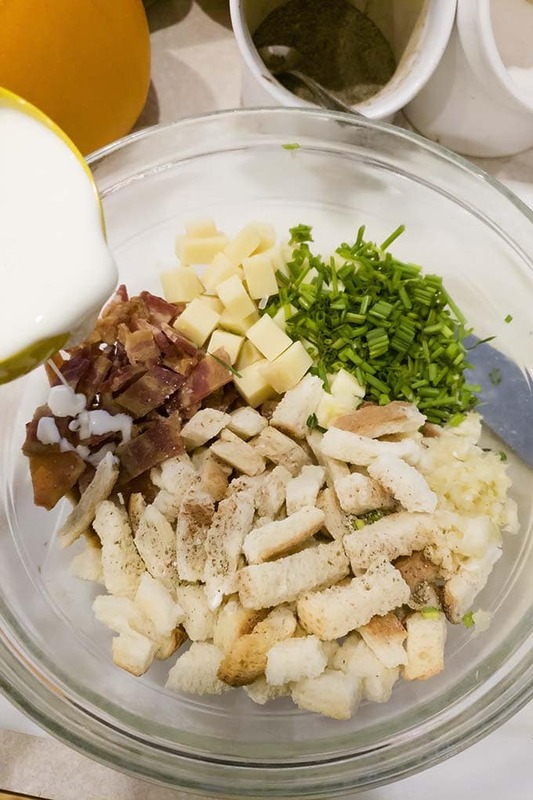 Add all of the stuffing ingredients together in a bowl and mix well. Some variations on the stuffing that I like are sausage and apple with rice, or add some sautéed mushrooms to the mixture. Nuts are also good in this. Pecans, walnuts, etc. 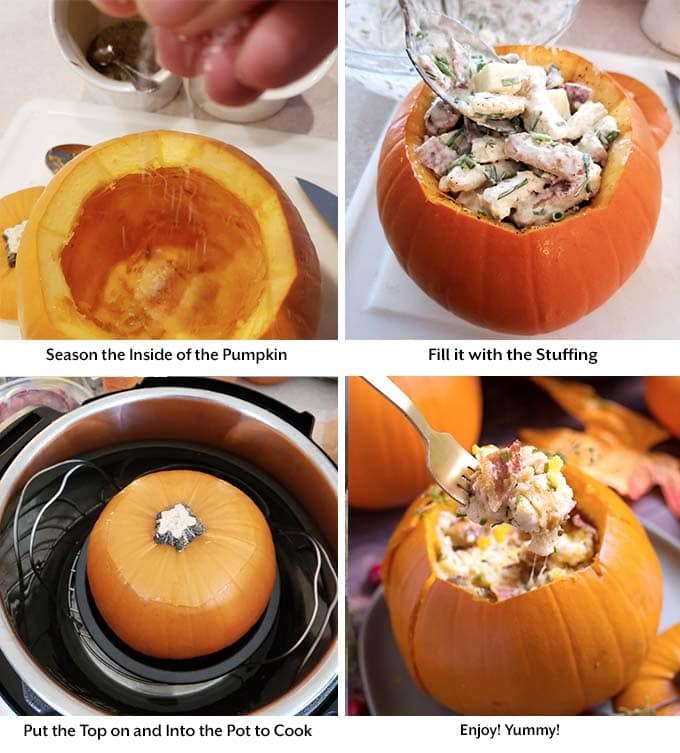 If you already have a favorite stuffing recipe that you could scale down to fit this little pumpkin, give it a try! This would be a lovely meal for a Fall date night where you are staying in. This would also be wonderful at Thanksgiving. Instant Pot Stuffed Pumpkin is so delicious! This is a Fall recipe that can be a main dish or a side dish. 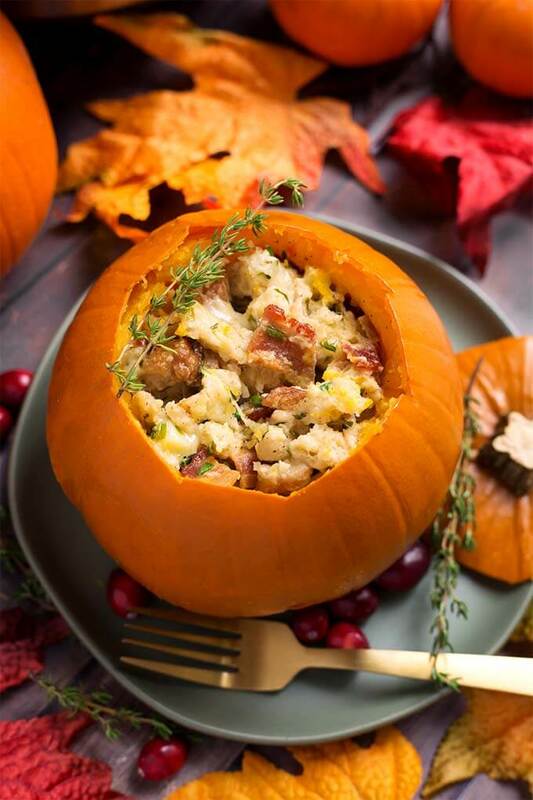 A pumpkin stuffed with a savory and creamy stuffing that you can change up to make it your own! Cut the top off of the pumpkin with your knife at a 45° angle, just like when carving a Jack-o-Lantern. Remove the seeds & stringy fibers. Save the top. Salt and pepper all over the inside of the pumpkin. Set aside. Add all of the stuffing ingredients, except for the cream, to a mixing bowl. Then mix them up very well. Next, pour the cream over the stuffing mixture and toss to coat all of the stuffing. Let it absorb, then decide if you'd like it creamier, or if you like it as is. I like mine in between, so I usually use 1 1/4 cups of cream. Stuff the pumpkin with the mixture to the top, gently pressing it in, but not too tightly packed. You may or may not have leftover stuffing. Put the top of the pumpkin back on and gently press it in place. Pour the water into the inner liner pot of the pressure cooker. Set the pumpkin in the cake pan, and set it on the trivet/rack. Carefully grasp the handles and put the whole thing into the pressure cooker. Close the lid and set the steam release knob to the Sealing position. Press the Pressure Cook (or Manual) button or dial, then the +/- button or dial to select 11 minutes. When the cook time is finished, do a Quick Release of the steam/pressure by turning the steam release knob to the Venting position. Use a small sharp knife to pierce the pumpkin to see if it is done (unless it's obvious as sometimes the skin comes partway off). If for some reason it is not soft enough, put the lid back on and cook for another 2 minutes. Using silicone mitts or a good set of pot holders, very carefully lift the rack out, making sure the pan doesn't slip off, and set to cool a few minutes. Remove the pumpkin top and serve. 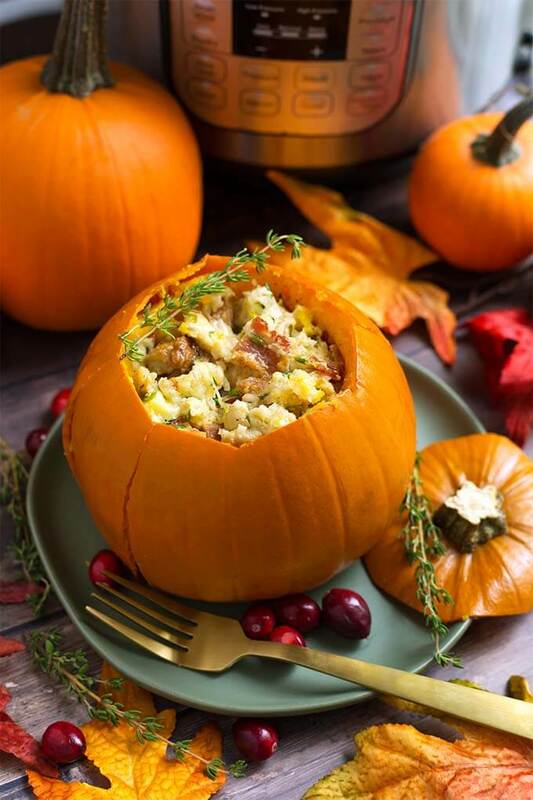 You can cut the pumpkin in half, or eat out of the pumpkin whole. The skin should just fold down and away from the pumpkin. Pour some more cream over the top for a softer stuffing, and add more salt to taste, if needed. You can make any variety that fits your mood or diet. Perhaps some cooked ground sausage, apple, and rice would be tasty. Or you may want to make this vegetarian (try adding some sautéed mushrooms). Endless possibilities! I made this last night and my husband and I were not prepared for just how deliscious this was. Seriously, on of the BEST meals we’ve ever made! Many thanks! Hi Leone! I’m so glad to know this! I tried to explain how delicious this is, but it was hard finding the words! I’m so glad you and your husband enjoyed the recipe!